RAND PAUL - KING OF PARTY, BUT PRESIDENT OF THE U.S.? Rand Paul is not as extreme as his father, Congressman Ron Paul, is; but he likely still too far to the right to procure his party’s nomination. 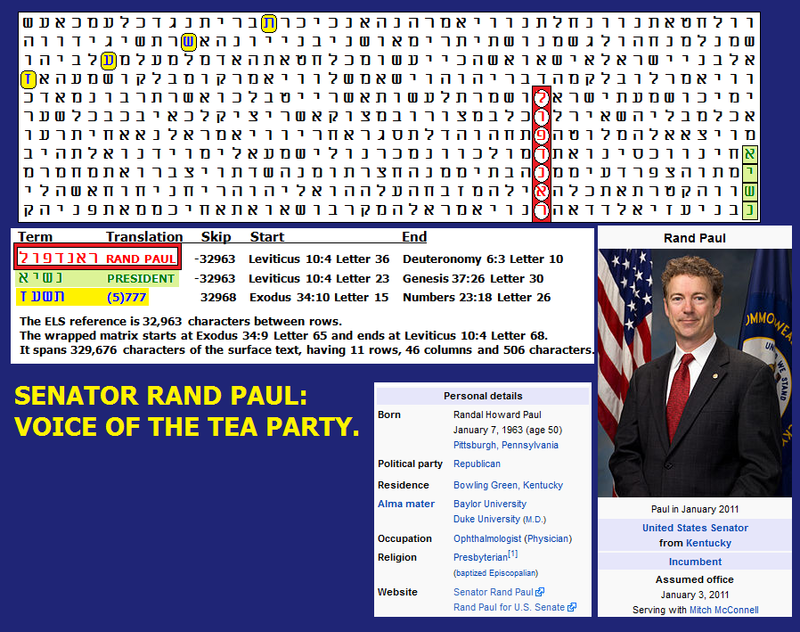 Although PRESIDENT is shown on the matrix below at the same skip as RAND PAUL (the axis term), the Hebrew year of the next Presidential election (5)777 required a matrix 506 letters in area, and the matches did not occur until the 10th lowest ELS of RAND PAUL. The odds against this matrix were calculated to be about 8.68 to 1, which means that it is not statistically significant. I do appreciate his standing up the the NSA, and I would vote for him without hestitation, but I don't think I'll get the chance in the general election.